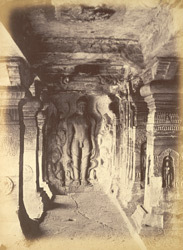 Photograph of the sculptured figure of Gautama Rsi in the porch of the Cave 4 at Badami, taken by James Burgess in 1874. Badami, formerly known as Vatapi, was the capital of the early Chalukya rulers in the 6th - 8th centuries. The town is situated between two rocky hills of red sandstone that surround an artificial lake. There are two later forts that overlook the town. Around the south fort there are four rock-cut shrines while structural temples dominate the site on the opposite north fort. At the eastern end of the lake there is the Bhutanatha temple complex.Cave 4 is a Jain temple which was excavated in the 6th century, later than the other Hindu caves of Badami, and is smaller in scale and less elaborate. The sanctuary is excavated into the rear wall of a columned mandapa or hall , approached through an outer porch. On the wall of the verandah there is a sculptured figure of Gautama Rsi, a Jain saviour.